This 3-view for the Beechcraft Model 17 Staggerwing is being offered free of charge from Model Airplane News. 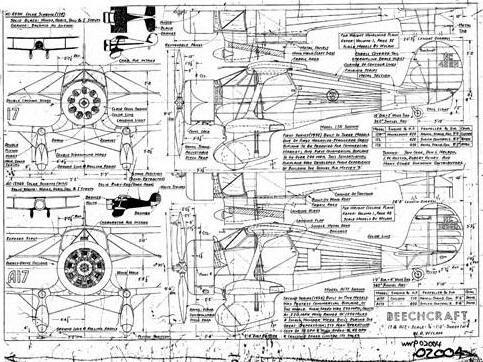 "We became more than just a little excited when we discovered we had complete sets of the original pen- and-ink drawings of the very first, fixed-gear Model 17 (Staggerwing) Beechcraft from the master, William Wylam. These are superb collector’s items!" See also Beechcraft Staggerwing 4-view.